Roxy was born in Roscommon. Her mother is Misty. Her father is Bran. Roxy has seven siblings, all of whom went into the sheep and cattle business. 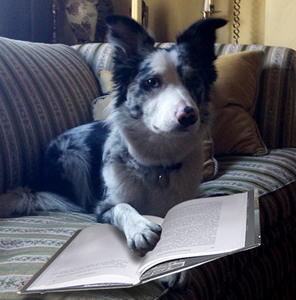 Roxy is the first of her family to go into publishing. She has worked at Phaeton since she was ten weeks old. I have been asked to write about matters literary and cinematic. I’ve decided to start at the top – with The Great Gatsby – a much admired book, but also much misunderstood. Everyone at Phaeton practically genuflects when The Great Gatsby is mentioned, that’s how good they think it is. I think it’s good too, but then I get it. Much as the people at Phaeton admire it, they don’t get it at all. When they talk about the tragedy of Gatsby, they think of Gatsby himself as the tragic figure. Well, he had a romantic mind, all right, and I wish he hadn’t come to the end he did and that his faith in almost everything wasn’t so misplaced, but we have to leave him aside for a minute to see the real tragedy of the story. You may find this hard to believe, but a lot of people don’t even remember that there are two dogs in The Great Gatsby. They remember Mrs Wilson’s puppy, all right, but no one remembers the second dog. What I mean is, if you want to talk about “vast carelessness”, what about the way Nick acted with his own dog? You know, the dog no one remembers. This is what he said about it – all he said about it. It was in the first chapter, when he was talking about moving into his cottage. And that’s it. The end. That’s why most people don’t even remember he had a dog. Nick hardly remembered he had a dog. You’d think what he’d say next was how he tried to find it – you know, put posters up on trees or put ads in the newspapers or got together a search party and they all went out whistling and calling its name (and the reason I say “its” name because he doesn’t even tell us if it was a girl or a boy dog). He doesn’t even tell us what kind of dog, or how old it was. “Vast carelessness,” that’s what I call it. And then there was the puppy. 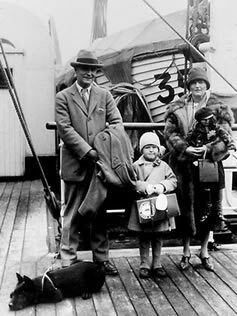 People remember the puppy all right – the one Mrs Wilson picked from a basket of “very recent” pups being sold in New York – but no one knows what happened to her, and I don’t know if anyone even cares. My own guess is that the little puppy didn’t last too long. The indications aren’t good. And that’s it. That’s all the real information. Afterwards, you just have to turn detective, and make what you can out of a few ominous references. So why did Mrs Wilson have a dog leash in the Valley of Ashes? If the dog were still around, wouldn’t that leash most likely have been left in New York? “Vast carelessness” hardly begins to describe it. I’m told to write about literary stuff in which I have expertise, so I’ve decided to write about socks with clocks. I know a lot about socks with clocks. I cut my teeth on them. It was about eleven o’clock in the morning, mid October, with the sun not shining and a look of hard wet rain in the clearness of the foothills. I was wearing my powder-blue suit, with dark blue shirt, tie and display handkerchief, black brogues, black wool socks with dark blue clocks on them. I was neat, clean, shaved and sober, and I didn't care who knew it. I was everything the well-dressed private detective ought to be. I was calling on four million dollars. 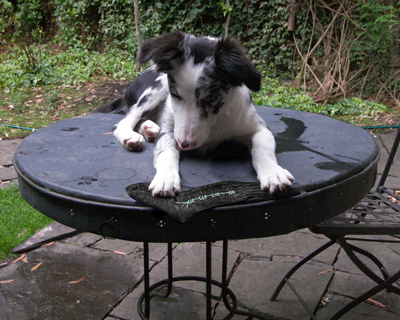 I’ve never seen anyone wearing a sock with a clock, but there was one pair of them lying around here when I was a pup. 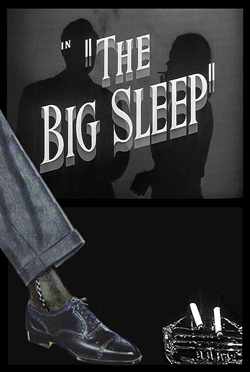 I don’t think they’d been bought to be used – just as a kind of homage to The Big Sleep. Every sock has possibilities for a pup, but the socks with the clocks were the best. This was how it worked: I’d steal a sock, and someone would chase me calling “Roxy come back with the sock,” except when it was the Philip Marlowe pair, and then they’d say “Rox come back with the socks with the clocks”. We all thought that was fun. So what is a sock with a clock?, some of you ask. Well, the explanation is pretty interesting, but I’m not saying it’s straightforward – it involves geometry, history, linguistics, and design. Still this is a highbrow blog, so here it is. First, if you’re wearing (or chewing) a sock, look down at it, and you’ll notice that there’s a triangular bit at the ankle. This is where the gusset of a sock meets the rest of the sock (ask a knitter if you want to know more about gussets). 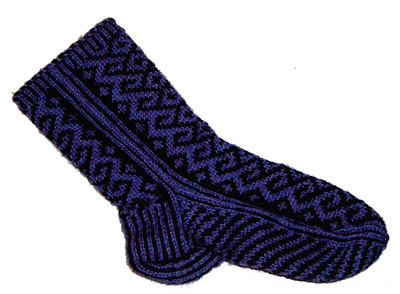 Socks are actually pretty complicated things, and the reason they need a gusset is to make the transition from the foot to the leg – from the horizontal to the vertical. In other words, just at the point of the sock where it matters – where you want your ankle to look nice and small and tidy – a lot of different bits are coming together. So before modern weaving methods, this had the potential to be a pretty messy area. That was why the practice arose of adding a bit of decoration around the gusset and running it on up the leg – to fool the eye about the mess that was around the ankle. The decoration could be in different thread or different stitching or whatever. This is The Clock. So why did they call it a “clock”?, you ask. Well look down again at a sock on your ankle. The gusset might look a bit like a triangle to you, but with a stretch of the imagination, couldn’t you see it as bell-shaped? You see, the word in Middle English for “bell” was “clok” (and it’s reasonable enough that this led to the modern word “clock”, because the bells of monasteries were kind of like the people’s clocks in the middle ages). So that is the best theory about how that particular bit of decoration on a sock came to be called a “clock”. A gore or triangular insertion into a garment to widen it at that point, as with collars, stockings, etc. “Of a band (collar) the clocks (are) the laying in of the cloth to make it round” (1688, R. Holme, Amory). In the 16th century the cape portions of some of the hoods worn by women were with or without clocks. Also, since the seams forming the triangular insertion began to be embroidered, the term clock was transferred to this form of embroidery and the clocks of stockings came to mean embroidery at the ankles, whether gored or not. For the really, really highbrow who might want to describe the clock of a sock in French, it’s une baguette for an ordinary clock, or une baguette à jours for “an openwork clock” – “openwork” meaning of lace or of crochet or of something with (intentional!) holes in it.